Deaf dog: Hobo is a one year old Australian Shepherd. 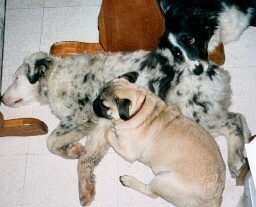 Other pets: Tasha, an Australian Shepherd; Leo, a Pug. Deaf dog: Ryley Clayton, a playful Old English Sheepdog puppy. 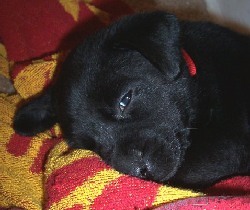 Other pets: Tom, a mixed breed dog, had been found with a badly broken leg eating out of a dumpster (all better now!). 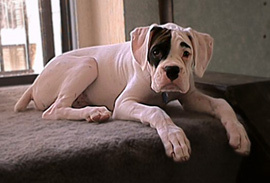 Deaf dog: Salty Dog is a 4 month old Boxer. His family says "Salty Dog started out as a foster dog but after only 3 days I realized I had to have him with me forever. I adopted Salty Dog through the Greater Ohio Boxer Rescue of which I volunteer. Salty loves to kiss, chase and chew on his Boxer sister Aliah's hind legs and he will do anything for peanut butter. Deaf dog: Chase is an 11 month old Boxer. 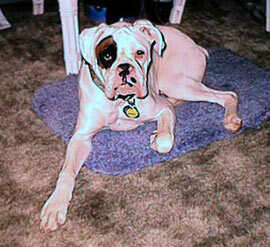 His family says "In working with Greater Ohio Boxer Rescue I have come across many great dogs. One evening I went out to pick up a white deaf boy (now my baby) whom I immediately fell in love with and adopted shortly thereafter. Chase is the cutest little guy even when putting on his antics. He is definately a lover and spends most of his time either snuggled up with me or his brother Franklin (also a rescue). He also loves to spend time playing with his sister Kola and friends Cody, Salty, and Aliah. He's mommy's baby!!" 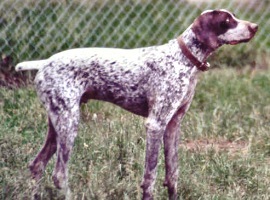 Deaf dog: Matthew is a 7 1/2 month old German Shorthaired Pointer. His family says "Matthew is a rescue puppy who I adopted from German Shorthaired Pointer Rescue of WI. I have adopted from them in the past so they were aware of what type of environment he would be living in. I have a very active and very loving home. I have 4 hearing dogs besides Matthew. He doesn't think of himself as being deaf. He runs and romps around the backyard with the others and has a wonderful time. Why tell him that he's different? I am in the process of teaching him basic obedience commands and am going to enter an obedience class where the instructor has experience with deaf dogs. I teach and participate in agility classes and hope to someday get him involved in that. He loves doing different activities and he is not afraid to try new things. He has quickly won our hearts and become a very solid member of our family. He is dearly loved by my daughter, me, and the other dogs. We think of Matthew as a gift." Deaf dog: Rock is an Australian Cattle Dog who is learning home sign language. His Mom says: "Rock is such a sweet boy, he is learning quick. He LOVES to play, you would never tell that he was deaf. Friends are shocked once that I tell them. I got him from a GREAT rescue that is located in Granville, Ohio. http://www.welsh-hills.com She doesn't have other deaf dogs, mainly ACD'D." 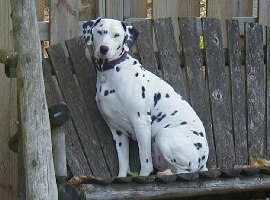 Deaf dog: Augie is a 3 year old Dalmatian mix. His Mom says, "Augie is the most sweet and loveable dog. He is very affectionate and attentive. Augie was rescued from a shelter at 7 mos. He is very laid back and gentle. He is very vocale when trying to get your attention and it is always a pleasure to be greated by him when I return from work." Deaf dog: Libby is a Australian Shepherd. "We rescued Libby from Forgotten 4 Paws in Nellsonville Ohio when she was 3 months old. She had been left on the side of the highway at about 10 weeks. She is a bundle of energy and tries hard to please. We are now trying to get her to not be afraid of other people (and the vet!) Any ideas?" Other pets: Mojo -- nine year old Australian Shepherd mix and Donovan -- the cat. 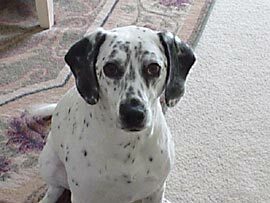 Deaf dog: Sampson's human pal writes: "We adopted our Beautiful Dal from Greater Ohio Dalmatian Rescue. We love him very much." 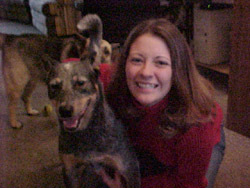 Deaf dog: Freckles is a 4 year old Australian Cattle Dog. "Freckles is absolutely fantastic! Her mother had a bladder infection while she was pregnant and, even though we treated the infection, the bacteria passed through the placenta into some of the pups. All were born able to hear but 3 eventually lost most of their hearing from the infection. Freckles can hear very high pitched noises (she certainly knows the ice cream truck bells!) and very low noises (I drive a diesel truck and she knows immediately when I start up our very long lane). Deafness has nothing to do with intelligence!! She is quick to learn, loves to travel, is super about "checking in" when off her leash, and loves everyone that she meets. She has to be one of the happiest dogs I have ever known. I cannot imagine my life without her!!" Human companions: Janet Hurr, her husband, daughter and son-in-law, a step-grandson, and another grandson on the way! Other pets: 3 hearing Cattle Dogs, 4 cats, and 8 horses. Deaf dog: Karma is a 12 week old Lab mix. "This little baby was going to be put to sleep at my local shelter just because she is deaf. I couldn't let that happen! We are just starting out on our quest of learning and training. But I am prepared to see it through, and be her support because no one else would." Other pets: A Pekinese, Kiddo, who thinks he is "daddy" to the new little one.